The Robbie Ribble Colouring Competition has seen a steady trickle of pictures coming in... it was hard to decide which were the best three as they were all GREAT!!! So thanks to all of you for sending them in! The overall Winner is this fabulously bright and colourful one sent in by Laura S of Dublin - it also gets a special mention for coming so far!! Thanks Laura, it's great! Our second Winner is Hattie B of Penwortham, a lovely picture - beautifully and carefully shaded - thanks Hattie!!! And our Third Winner is a brightly-coloured picture with a very cross-looking Robbie Ribble from Charlie of Frenchwood - thanks Charlie!!! 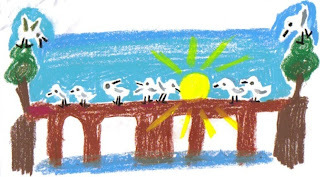 And a Special Mention must go to our young friend "I" who has sent in another of those fabulous pictures - this one of the Seagulls on the gas pipes waiting for the tide to go out so they can have their lunch! Thanks "I"!!! Bob has sent us some more of his fantastic photos of the Ribble. 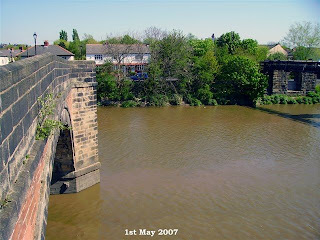 ...and this one was also taken on May 1st, showing how silty the river's waters often are... thanks Bob! ...and this one is April at low tide on a misty morning, the trees are still quite bare although a hint of greenery is definitely showing. 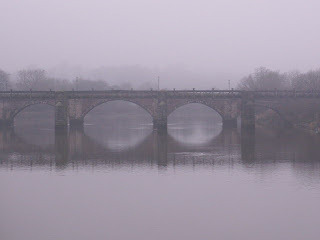 And this one is a view of Penwortham Old Bridge from further upstream on a cold and misty wintry day, also by JB. Councillor Jack Davenport, the Labour Councillor for Riversway Ward in Preston, is again spearheading an independent consultation with local residents - this time about the Ribble barrage proposal. This is as a direct result of local people's anger that these irresponsible and dangerous proposals are being pursued by Preston City Council and the unelected Vision Board - without even asking us if this is what WE want. Councillor Davenport told the Lancashire Evening Post today that 'The key concern' Preston Labour group members have 'is people are being asked after, instead of before, about things like the barrage'. 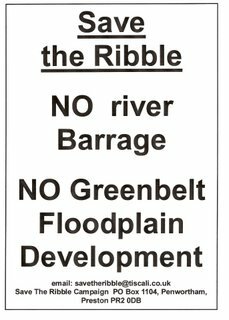 The aim is to send out consultation leaflets to 7,000 homes in key Riverside Wards of Preston - Riversway, Fishwick, Frenchwood, Larches, and the Town Centre - at the beginning of next month, to ask local residents in Preston for their opinion of the Ribble barrage scheme. Jack Davenport said 'We've had to increase the scale of the consultation because the barrage is far more controversial than the docklands ever was', and has also said that 'We're going to be as balanced as we can be, giving people both sides and letting them make up their own minds, then at least we have got something to take back to Council'. BUT it is clearly nowhere near enough to only consult what is effectively only ONE OF MANY Ribbleside communities that will be affected by these proposals. At the very least, this forthcoming consultation should include similar areas of Penwortham, who will be affected in exactly the same way as the Preston communities on the North bank of the River. All Ribbleside communities who will be affected by the barrage proposals should be consulted - NOW. 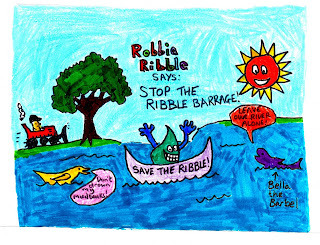 Save The Ribble Campaign can assure local residents all along the Ribble that we will keep the pressure on in our campaign which aims to ensure that ALL residents are consulted, and that Environmental organisations who have also raised serious concerns about the barrage proposal are also consulted sooner rather than later. 81% of respondents AGAINST the barrage proposal - a figure echoed by the huge number of residents who have contacted us - nonetheless, we have also consistently argued that even had this vote shown the opposite, the River CAN’T VOTE, and as such, relies on us to make decisions which safeguard rather than threaten its environmental integrity. 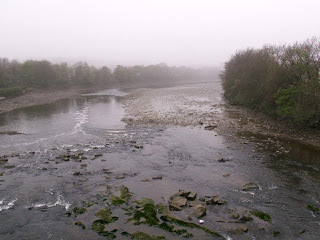 The River Ribble is not "ours" to mess with - contrary to Preston City Council's view, the Ribble is not an 'underutilised resource' to be exploited for economic gain, but an Internationally important Wetland ecosystem which supports nearly 1 million birds and who knows how many hundreds of thousands of fish who don't have the luxury of a vote. Yet this is not a "Birds vs People" argument as the Environment is something which benefits humans as well. - and The Ribble also offers us a fantastic opportunity to create and maintain a genuinely sustainable future. As Michael Jack, MP for the Fylde, said very succinctly: “Mankind has an enormous responsibility to look after the estuary and its wildlife and I don’t think we should be monkeying around with that for the sake of making money. You play around with nature at your peril. I remain deeply sceptical about this proposal.”(The Lytham St Annes Express, on April 19th 2007). 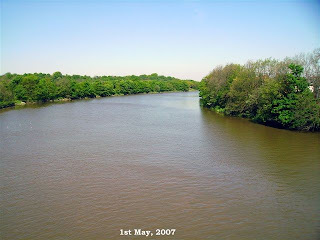 Even if the entire population of Preston, South Ribble, Fylde, and Sefton WANTED a barrage on the Ribble, it still wouldn’t be anything other than disastrous for the environment. As custodians and guardians of this precious habitat and its environs of associated habitats such as riverside green spaces and wildlife corridors, we have a responsibility to ensure that our actions are not detrimental to it. If you don't live in one of the areas of Preston that Jack Davenport is consulting, contact your local Councillor and ask when YOUR community will be consulted. Where do YOU live? What is YOUR opinion of the barrage proposal? Q: WHEN IS A PLAN NOT A PLAN? 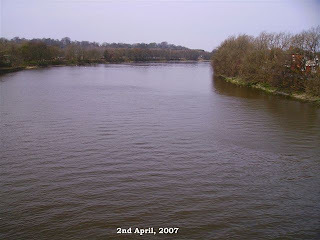 It seems that whenever members of the public voice concerns over the prospect of a barrage on the Ribble and the urban development of Penwortham Green Belt (Riverworks Documents 01 "Quality Riverside" and 04 the “Central Park” Development), Preston City Council is always quick to respond with the claim that these are “ideas” only and that there are "no proposals" or "plans" to build a barrage on the river or build on our Green Belt and floodplain. In response to the concerns raised by residents in the Fylde about the barrage scheme, a spokesperson for Preston City Council told the Lytham St Annes Express (April 19th) that the Ribble barrage is purely the “stuff of dreams at the moment” and that “it is not a proposal”. This is the mantra that Preston City Council has consistently repeated since it launched its Riverworks “dream” in an attempt to diffuse the widespread opposition from both local residents and environmental groups. 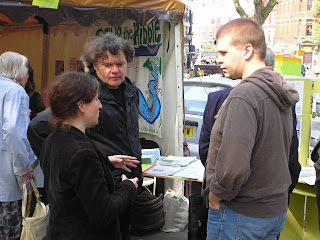 However, while Council officials merely insist that there are “no plans” or “proposals” to build a barrage on the Ribble or build on our Green Belt, and that further “feasibility” studies need to be completed for their "ideas", they fail to address the real and legitimate concerns that are being raised by residents and environmental organisations. Furthermore, their own documents also show that these schemes are indeed “proposals” and “plans”, and that the direction of PCC’s policy, through the Vision Board, is to actively pursue both the barrage construction, and the building developments on the Green Belt and floodplain. 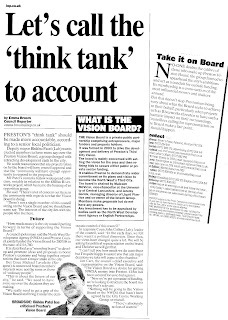 In a recent article in the Lancashire Evening Post (10/5/07), Jim Carr, Chief Executive of Preston City Council, refers to the “visionary ideas” of Riverworks and suggests that the council has a duty to give them serious consideration. Mr Carr also insists that feasibility work will need to be completed if and when the council is in a position to develop the ideas. 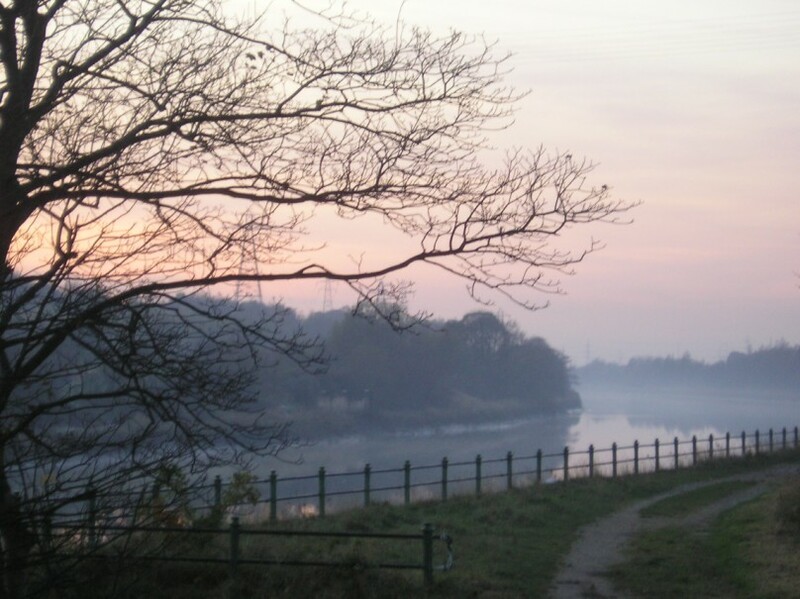 “Instead of the city ‘turning its back’ on the river, the Ribble will form the heart of future planning of the Preston-South Ribble urban area. Key project proposals include the development of a barrage across the river providing a range of economic benefits and the development of a new ‘Central Park’ with associated residential development” (p.7). Click on the picture to enlarge it. This Prioritised Action Plan also shows the Penwortham Green Belt with housing superimposed on the top. The strategy also proposes a new “gateway” to the City in the form of a new River crossing, linked “to the proposed construction of the barrage” (p.8). 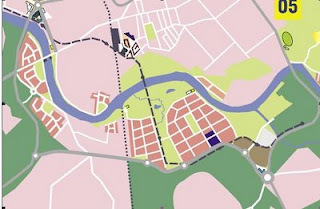 So while PCC claims it has no plans to build a barrage on the Ribble it has adopted an Action Plan which clearly places the “construction of the barrage” as a ‘Key project proposal’, therefore an essential component of its economic development strategy - as confirmed in the document itself which states: "Riverworks is an essential component of the overall Strategy" (click to enlarge the picture of p7 above). The Riverworks proposals for Riverside East (Riverworks: see Document 05) include more residential and "commercial office" developments (apparently on Frenchwood Rec and Fishwick Bottoms) and “An extension of the river walkway through Riverside East [East Preston] to link to the former Brockholes Quarry site which will become a major visitor destination”. The Riverworks document also states that it will provide the “reprovision of sports facilities drawing people to the river front and encouraging its active use” where "it will offer water based recreation pursuits, enabled and supported by the barrage. Riverside East will link the communities of South Ribble and Preston by providing accessible and well utilised leisure resource centred around the River…establishing a major outdoor leisure resource” explicitly linked to “the former Brockholes Quarry site". But there is no need for a barrage to “enable and support” a fishing lake, and environmentalists and angling organisations are vociferously opposed to the barrage because of the enormous damage it will cause to fish and other wildlife. The stated aim “that a 4km stretch of the River Ribble will be brought into active use through these proposals” strongly suggests therefore that the intention for Brockholes is that it will be part of their water sports facility. PCC will maintain that this is ideas only, but this is contradicted by their own recent Press Release on page 6 of their magazine PubliCity: 25/4/07 Issue 6, which states that “plans are in the pipeline for a ‘major outdoor leisure resource’” at Brockholes and Fishwick. “Riverside Re-vamp: An £800 million vision for the Riverworks scheme, a 20 year plan to create jobs, homes, leisure facilities and a city park [Central Park building development] centred on the river and canal is being developed. Amongst the proposals are a landmark building and a performance arena at the marina end of Preston docks. On the East side of the City, centred on Fishwick and Brockholes Brow plans are in the pipeline for a ‘major outdoor leisure resource’”. In other words they maintain that the barrage is only an idea but have “plans… in the pipeline” for a “major outdoor leisure resource” which Preston City Council have explicitly linked to the “construction of a barrage” to “enable and support” it. In response to Cllr Swindell’s questions about the pursuit of the barrage scheme it was confirmed that PCC will be applying to the NWDA for £235k for the barrage feasibility study. They confirmed to Cllr Swindells their intention to continue pursuing their “plans”, and their determination to “go ahead” despite “the concerns expressed by RSPB, Environment Agency, Michael Jack and many others”. The question is, WHY do they need to spend £235,000 investigating the "feasability" of a barrage on the Ribble when Environmental experts have enough knowledge about the impacts of such a scheme to oppose it NOW, whether an "idea" or a "proposal"? The Wildlife Trust "shares the concerns of the RSPB… any development that would further constrain its natural functioning is a bad idea, and would presumably be in breach of the UK Government’s obligations under international convention and law." "The history of barrages placed across rivers shows that they impede migratory fish. 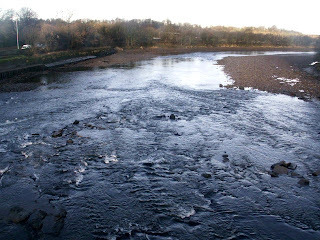 The Ribble, thanks to the great efforts of anglers…, the habitat work of the Ribble Catchment Conservation Trust and Environment Agency, is just beginning to meet its spawning deposition target. Anything that puts this development back will put the Ribble at risk as a major salmon river. The whole ecosystem of the Ribble is delicately balanced yet Preston City Council refuse to speak to angling representatives." - According to the Environment Agency, ‘the presence of a barrage structure across the [river’s] main water body automatically places it at high risk of not achieving the WFD [EU WaterFramework Directive] objectives’. 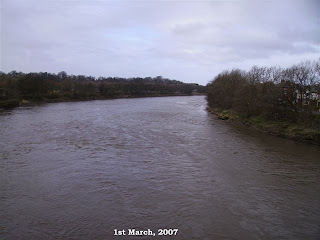 The River Ribble is the UK’s Pilot WFD River. 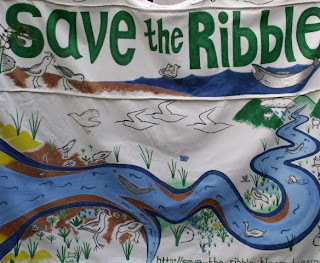 It is also the case that the many Legislations which protect the Ribble because of its International, and European and National importance to the environment presume AGAINST any project which might impact on this delicate inter-tidal ecosystem - unless there is no alternative - WHICH THERE IS! 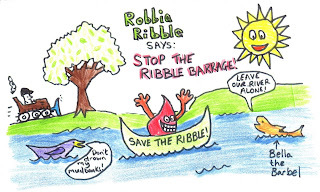 Read more about why a barrage would be so damaging to the Ribble's environment. This is patent nonsense. 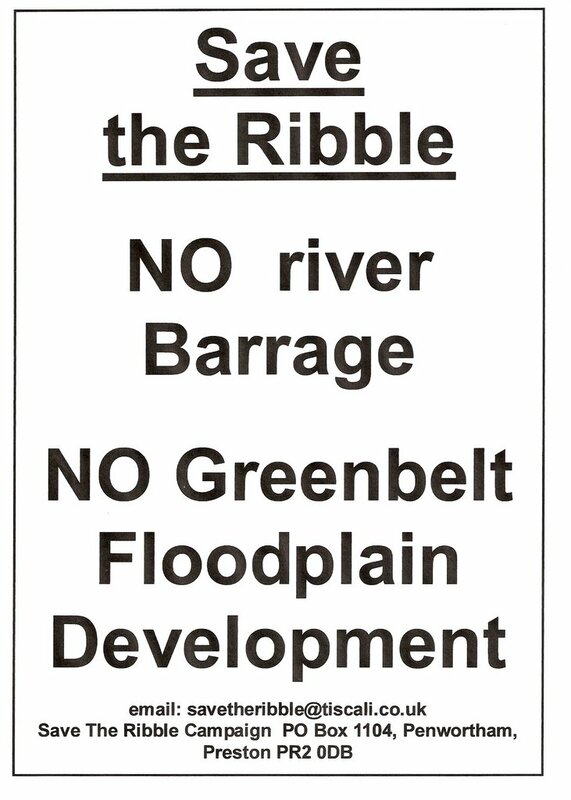 Thousands of us already engage in all of these activities along the Ribble as NONE OF THESE ACTIVITIES NEED A BARRAGE. It is the height of stupidity to claim that leisure resources will be increased by plans that will destroy our Green Belt, our allotments, football pitches, the biodiversity and tranquillity of the River and riverside areas, and the very environment which hundreds of thousands of birds and fish and other wildlife depend on. - and thereby also undermine the very thing which forms the basis of the Ribble Coast & Wetlands Regional Park, and the £115 million this will generate every year from new visitors. Preston City Council should start publicly engaging with the concerns that local residents and Environmental organisations have about their “plans” for the Ribble and its Green Belt instead of trying to diffuse opposition by denying that they have “plans” at all. 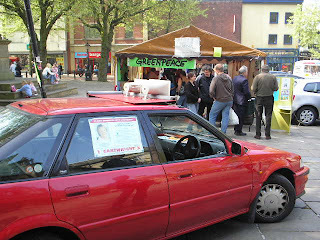 If Preston City Council listened to local residents, Environmental organisations, and other communities and their representatives along the Ribble corridor, they would stop pursuing these irresponsible “plans” or “key project proposals” or whatever they want to call them once and for all, for the sake of the environment, local communities, and the future of the most important estuary River in Britain. 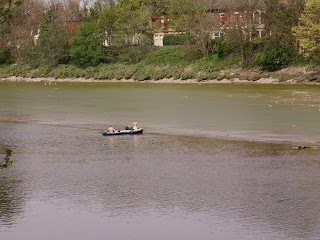 The Preston City Vision Board is the body responsible for coming up with the unpopular and environmentally irresponsible idea of barraging the River Ribble, and of building large amounts of housing in the beautiful greenbelt areas in its floodplain. Councillor Bhiku Patel recently asked Preston City Council "How much money is the city council putting forward in terms of supporting the Vision Board"
The answer given by 'a Council Spokesman', and printed in the Lancashire Evening Post was this: "The North West Development Agency and Preston City Council jointly funded the Vision Board for 2007/8 to the tune of £116,760". However we find that when we check the record in Hansard, on 26th October 2006, Margaret Hodge told Geraldine Smith MP that the North West Development Agency had given Preston Vision Board £457,000. There seems to be a very large difference between the figure of £116,760, which the Preston Council Spokesman says comes from BOTH the NWDA and the Council, and the £457,000 that the Minister said came solely from the NWDA. The Council's quoted figures seem totally out of line with those given by the Minister, especially as we know that the feasibility study into the docks development cost over £120,000, and the feasibility study into the Barrage and Housing plans is likely to cost at least £235,000 (and as this is future expenditure, we don't think it was included in the Minister's figures). Exactly how much public money is the Vision Board getting? How much comes from the NWDA and how much from the Council? What exactly are they spending it on? How much, for example, was spent on lunches where Vision Board members met "key decision makers" as part of their "Contact Strategy"? It's time for some transparency and democratic accountability from the businessmen and bureaucrats who are deciding the future of Preston and our river behind closed doors - as this is public money, we should have a right to know exactly how every penny is being spent, and whether it is being spent in our interests, or in the interests of greedy developers. Local allotment keepers are fuming that Preston City Council should even be thinking about building housing and businesses all over their precious patches of land. Elaine argues that Penwortham Holme West is one of Preston's largest allotment sites, despite having already lost many areas to road building. 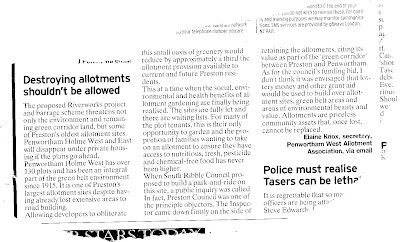 Losing it would reduce the allotment provision to Preston residents by a third, at a time when allotments have never been more popular, and when the sites are fully let and subject to a waiting list. 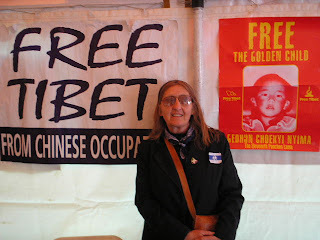 Elaine also points out that there are huge social, environmental and health benefits to the community offered by allotment gardening, and that for many families, this is the only way they can have access to fresh, nutritious and chemical free food. The allotments are part of the precious green corridoor between Preston and Penwortham, a corridoor the council wants to destroy, in it's aggressive plans to expand across the Ribble. Preston City Council is currently applying to the North West Development Agency for funds for a feasibility study into the Riverworks ideas - ideas that would mean the loss not only of these local allotments, but also of local football pitches, recreation grounds and beautiful greenbelt land, all for the sake of a 'water sports park' that nobody actually wants. 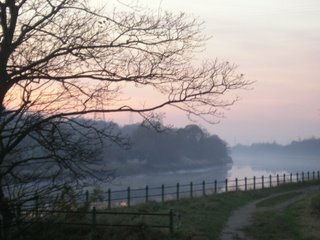 There is no doubt that Preston City Council could make a killing by redesignating this greenbelt area, and selling it on to greedy developers - but this would be directly against the interests of local people, who love our river as it is, without a barrage, and without large housing estates springing up along its banks. The NWDA must be stopped from spending public money on a project the public do not want, and which is directly against the interests of local Preston people. Tales from the Allotment, a blog by the Allotment Plotter. Fancy spending a Spring day messing about by the river instead of cooped up at work? Then we have just the thing for you! Local residents in South Ribble and Preston are spending Friday 8th June Spring Cleaning the Ribble's riverbanks in Penwortham and Broadgate. Come along and give something back to our fantastic river, and have a Grand Day Out at the same time! - and Spring Cleaning the riverbanks until 2pm. 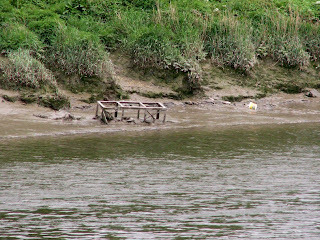 We will be litter-picking and removing the alien plant species Himalayan Balsam (which suppresses native British plant species), and the Environment Agency and Ribble Basin Campaign will be helping out too, and will be using special lifting gear to remove that old metal junk off the Ribble's fabulous mudflats! If we get enough helpers, we hope to clear up good stretches of both the Penwortham and Broadgate banks, so come along for a couple of hours for a spot of messing about on the river! Bring a packed lunch and plenty to drink - and a sunhat or a raincoat, depending on the weather that day. If you would like to join us, please email us at savetheribble@tiscali.co.uk to let us know so we can have a good idea of the numbers of people to expect. Click here for details about more Ribble Events. People lucky enough to have tickets to the Radio One Big Weekend in Preston should be finding them on their doormats today. If you are one of the lucky people coming to Preston for this superb event, featuring bands like the Kaiser Chiefs, Kasabian and the Scissor Sisters on Preston's Moor Park, why not find a contrast to the loud rock and pop music, by visiting the beautiful and peaceful banks of the River Ribble while you're here. If you take a Preston Minibreak, you will find some beautiful green spaces, will be able to admire some well-tended allotments, see some rare birdlife and maybe even catch a football match at Vernon Carus, Penwortham Holme or Frenchwood Recreation Ground. All these beautiful areas are under threat from the Preston City Council/Vision Board plans to barrage our river and build loads of housing and businesses on the Ribble's banks, part of their aggressive and environmentally unsound plans to turn Penwortham and much of South Ribble into a conurbation of Preston - they may all end up under concrete unless lcoal people and Save The Ribble can stop these irresponsible and environmentally damaging proposals - so visit them while you still can! 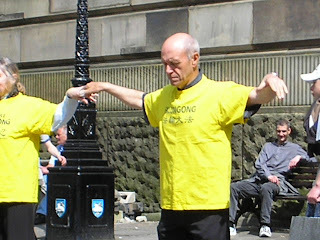 Now Bhiku is taking on the body responsible for first coming up with the Ribble Barrage idea, the Preston Vision Board. "There is not a single member of this council sitting on the Vision Board and we should have some say. The interests of the city lies with the people who live here"
"we really need to get a grip of the Vision Board and bring it under the democratic control of this council". Preston City Council and the North West Development Agency have been funding the Vision Board to the tune of £116,760 - but it is not clear whether this figure includes the large amounts of Council Officer time dedicated to supporting work related to Vision Board projects. It seems likely from the comments of John Collins, Council Leader, that the Vision Board will soon expand itself to include a few elected councillors. It remains to be seen whether the co-opting of a few hand-picked councillors will mean the transformation of the Vision Board from a body that has been secretive, unaccountable and has listened solely to the views of consultants and developers, to a body that listens to, and puts the interests of Preston people first. If they do listen to Preston people, they will have to dump their plans for a barrage and for a massive housing development on the Southern bank of the Ribble, because these are overwhelmingly opposed by local people, and directly against our interests, not just because they would raise the flood risk to local people, and mean the loss of land now used for football pitches and allotments, but also because of the terrible damage these ideas would do to our precious environment, and because they would leave us with an expensive white elephant, demanding huge amounts of money for it's maintenance every year. 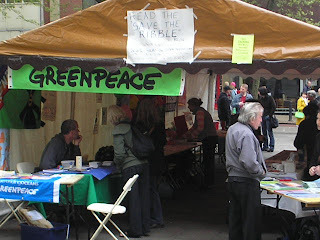 Save the Ribble enjoyed a wonderful Mayday on the Preston Flagmarket this year. 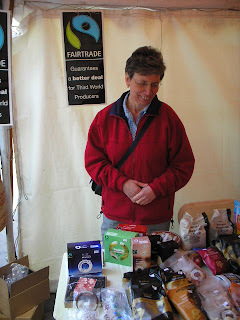 In contrast to the 'Preston FM I Care Day' we did not need to hold the stalls down against the force of a huge gale, and the ink on our posters did not bleed as the rain pelted down against them. 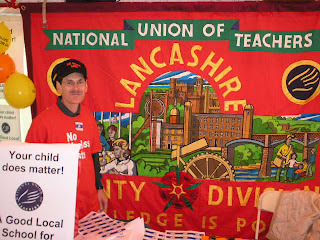 Instead we gently warmed ourselves in balmy Lancashire sunshine and gave out leaflets to hundreds of people, who were overwhelmingly supportive of our cause. 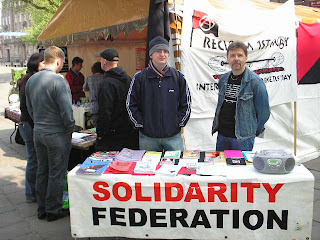 The day was supplied with socially conscious music by Independent Labour Councillor Terry Cartwright's suppporters. 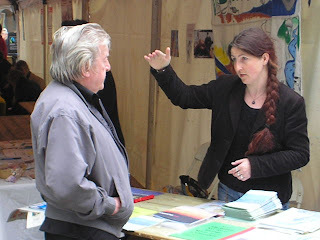 Jane Brunning, Spokesperson for Save The Ribble Campaign, talked at length with Councillor Terry Cartwright. Terry said he was very worried about the implications of the Riverworks proposals to local residents and would be asking lots of questions about the democracy of the Vision Board. 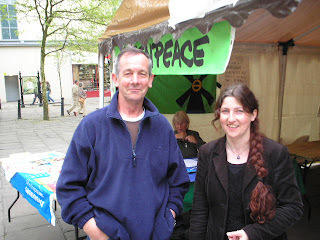 Jane also discussed the threat that the Ribble Barrage poses to local residents with Riversway Councillor Jack Davenport, who said he was deeply concerned about the Riverworks proposals, and the Ribble Barrage, and that he would be organising consultation meetings very soon with residents of both Broadgate and Middleforth. 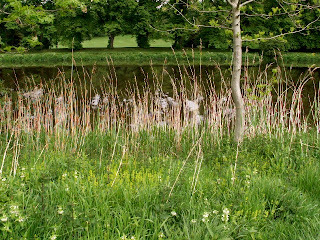 The Ribble in glorious Spring on May Day - thanks Bob, it's great to meet at last! 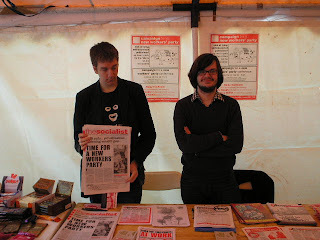 The Socialist Party were there, this group was campaigning against the presence of British Troops in Iraq and Afghanistan, against the privatisation of the NHS and for a New Mass Party of the Working Class. The Socialist Party members said that Preston City Council should not be kowtowing to rich property developers, but should defend ordinary people and the environment, and certainly should not barrage the Ribble. They said that capitalism was the biggest danger to our environment, and that socialism was the only way to save the planet from the disaster of global warming. 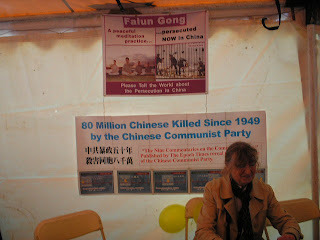 The Free Tibet campaign was there, raising the issue of a country occupied by foreign troops. 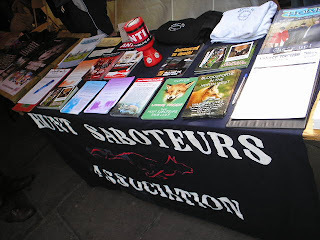 The Hunt Saboteurs had a presence, fighting to ensure that Fox Hunting never comes back. The message of Mayday is that 'Another world is possible' - we do not have to have a world where big business calls the shots. Ordinary people should have power, and be listened to. Save The Ribble believes that this is true about Preston, and the River Ribble too. 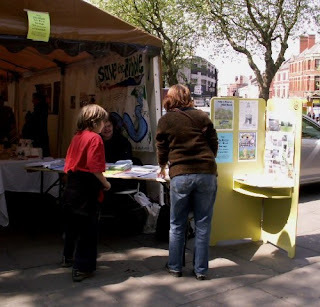 We feel that another Preston is possible, one where the wishes of local people matter more than the pockets of greedy property developers, one where our environment is seen as more precious than the portfolios of speculators. 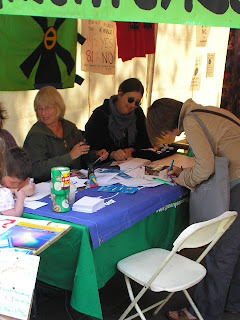 The message of Mayday is that when ordinary people unite together, they can achieve amazing things, this could include the defeat of Preston City Council's Riverworks Ribble Barrage proposals and the defence of local people's homes and environment from the depradations of profit-hungry developers, and their friends on the council. BTW: Click here for some great images of 52 arctic terns spotted by Bill Aspin on the Ribble near Warton on 2nd May, he also saw: 2 Common Tern, 20 Bar-tailed Godwit, 15 Black-tailed Godwit, 15 Dunlin, 5 Ringed Plover and a Greenshank, a bonus was seeing a female Hen Harrier heading NE over fields near Naze Farm. 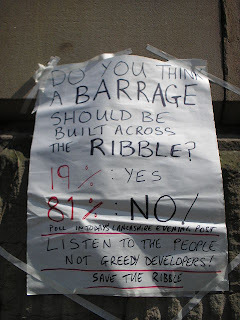 ... and a resounding NO to the Ribble Barrage vote in the LEP poll! These results reflect the impact our campaign has had in countering the developer's propaganda, and the common sense of ordinary Preston and South Ribble people. 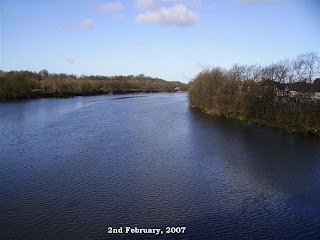 In Preston, Bhikhu Patel, John Swindells, and Michael Lavalette were all re-elected as local Councillors, and all vociferously opposed the Ribble Barrage as part of their campaign. They have all made it clear they are deeply concerned about the environmental implications of the barrage proposal, and have raised their concerns about the Riverworks building developments proposed for our green spaces and flood plain. In South Ribble, the Conservatives made massive gains – taking overall majority of the Council – after their strong campaign which included the core promise that they ‘are committed to fighting ANY moves to build on [South Ribble] green fields and open spaces’. - ‘the major location for growth within the Strategy will be in the wider Preston area, which “straddles” the River Ribble. Thus the Ribble becomes the central binding feature that contributes to the creation of a new sustainable community supporting the growth of the city centre’ (p24). ‘an opportunity to create a new community… in walking distance of the city centre’ … a ‘new residential development on the southern banks of the Ribble’ … of such a ‘size’ that it ‘will warrant investment in essential community facilities including retail and community meeting space’ … its ‘Buildings will be oriented to frame the proposed Central Park and to create a sense of enclosure’ (Riverworks Document 04: “Central Park”). Now these Councillors have won the votes of local people, they must keep their promises about opposing the Ribble barrage and not allowing building on the green belt - otherwise Save The Ribble will be the first to point out any discrepancy between their words and their actions. The Lancashire Evening Post yesterday ran the news we reported on Tuesday that Preston City Council are to move on to the next stage in their pursuit of a Ribble barrage by bidding for funding for £235,000 from the North West Development Agency for a feasibility Study into the barrage proposal. 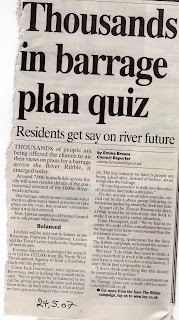 As part of their story, the LEP ran a poll asking whether the public think a barrage should be built on the Ribble. At the time of writing this article this morning, the results so far show a resounding NO vote – 77% of respondents AGAINST a Ribble barrage, which is a resounding victory for the Ribble. Nonetheless, even had this vote shown the opposite, the River CAN’T VOTE, and as such, relies on us to make decisions which safeguard rather than threaten its environmental integrity. On March 20th we published this post about Preston Vision Board. joint managing director of Flexcrete, a company that "manufactures a range of concrete repair materials and protective coatings for buildings and civil engineering structures, the water industry and marine structures, as well as specialist products such as car park decking systems and waterproof floor coatings". Jeremy Gorick has since contacted us and informed us that while he was in the past joint managing director of this company, he no longer has any connection whatsoever with Flexcrete. We thank Mr Gorick for contacting us and we are glad to make it clear that Mr Gorick is a FORMER managing director of Flexcrete, but has now severed all his connections with the company. It emerged yesterday during a Preston City Council committee meeting to discuss the Preston Vision Board that a bid for a £235,000 grant from the North West Development Agency to complete a feasibility study into the building of a barrage on the Ribble will be made this municipal year 2007/8, with the study carried out the following year, 2008/9. It was made clear this will go ahead despite the concerns expressed by the Environment Agency, the RSPB, Michael Jack MP for Fylde, and many others. In making this decision Preston City Council is intent on ignoring the advice of the Environment Agency, the RSPB and other environmental organisations, and the opposition of local residents, some local councillors and neighbouring councils. The decision also makes a mockery of Preston City Council's repeated assertions that the barrage scheme is "ideas" only and reveals their true intention to pursue the barrage at all costs. 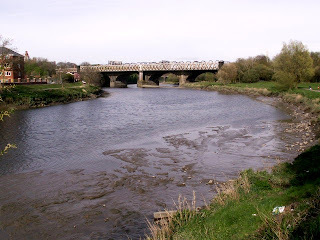 Council officials revealed that, in discussions on the proposed sites for the barrage, they have ruled out sites towards the Estuary and the River Douglas, and the sites to be assessed are at the Ribble Link and nearer the city centre. The intention is clear: the Council wants the barrage to provide a permanently high water level between the canal and the proposed 'major outdoor leisure facility' which is to be constructed at Lower Brockholes Farm, once the new quarry is exhausted. We have long suspected that the Planning Application to quarry at Lower Brockholes Farm was linked to Riverworks, but, despite denials even at yesterday's Preston City Council Committee meeting that this is a Vision Board scheme, it is nonetheless INCLUDED in recent Press Releases for 'An £800 million vision for the Riverworks scheme' which came from Preston City Council over the last few days. The Press Release is published in Preston City Council's "PubliCity" Preston City Newsletter Issue No 6 April 25th 2007), and the Lancashire Economic Partnership Newsletter, 30th April 2007 . An £800 million vision for the Riverworks scheme, a 20 year plan to create jobs, homes, leisure facilities and a city park, centred on the river and canal, is being developed. Amongst the proposals are a landmark building and a performance arena at the marina end of Preston Dock. On the East side of the city, centred on Fishwick and Brockholes Brow, plans are in the pipeline for a 'major outdoor leisure resource'. We were concerned about the loss of this last piece of ancient Brockholes farmland and about the potential impacts that quarrying and changes to its wetland ecosystem would have on adjacent Biological Heritage Sites such as Brockholes Wood and Brockholes Meadow, but we were also concerned that this quarry (which rather controversially stated the aggregate is needed for Riverworks in the application!) looked suspiciously like the much-denied but persistently rumoured marina to be built near the Tickled Trout... Yet this scheme was denied as being a part of Riverworks at the time, is STILL being denied as being a Vision Board scheme, yet clearly plays a significant part in Preston City Council's Riverworks 'PLANS... in the pipeline'. 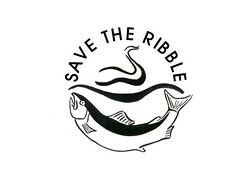 - How can they justify blatantly ignoring legitimate concerns expressed by numerous environmental bodies including the Environment Agency, RSPB, Wildlife Trust, the Ribble and Lancashire Fisheries Consultative Organisations, and Natural England to pursue the Ribble barrage scheme? - How can they justify blatantly ignoring and potentially breaching International, European, and National Law regarding the Special Protection Area Status of the Ribble to pursue their barrage scheme? 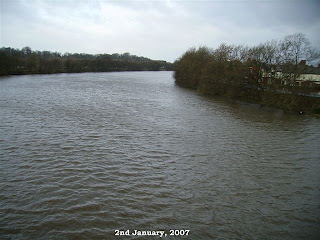 - How can they justify blatantly ignoring the concerns raised by local residents and Councillors in Preston and South Ribble, as well as neighbouring residents and Councils all along the Ribble, including Fylde and Sefton, to pursue their barrage scheme? - it identifies the risk of the impounded water becoming of such poor quality 'that fish life cannot be supported'. - the need to ensure no major changes occur in the flow and deposition of silts in the Ribble Estuary. d) The HUGE Environmental damage and HUGE economic drain caused by barrages which ties in current and future generations to spending literally £MILLIONS every year, year after year, to try to reduce the impact on floodrisk, water quality, fisheries, and wildlife. Preston has, according to figures released in the Local Development Framework documents, some of the most deprived areas IN ENGLAND, ranking 59th out of 354 local authorities in England in the 2004 Indices of Deprivation (compared to 172 for Chorley and 229 for South Ribble). So what are they doing about it? Putting in an outrageous and absurd application which seeks to bid for £235,000 in order to progress a £multi-million scheme - so much money which could be so usefully spent elsewhere - which will damage an Internationally important wetland ecosystem, be detrimental to our much-valued local environment, and increase floodrisk to communities all along the Ribble corridor. 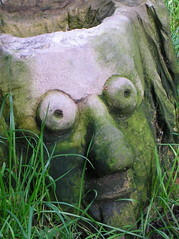 It will also be detrimental to the new Ribble Coast & Wetlands Regional Park, launched just weeks ago with exciting and innovative ideas to create environmentally and economically SUSTAINABLE tourism and jobs, and which, according to the NWDA's own figures, will bring in an extra £115 million in new visitors every year to Ribbleside communities. 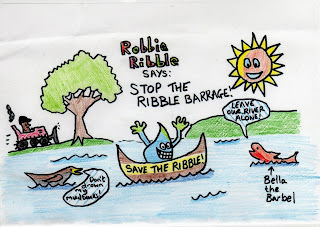 Preston City Council's Ribble barrage scheme is neither environmentally nor economically justifiable, is an outrageous waste of resources, and will be detrimental to our environment, to the economic viability of all Ribbleside communities, and to the Internationally-significant River Ribble. If Preston Council's leaders, and their developer friends on the Vision Board imagine local residents, and environmentalists across the country will meekly accept this irresponsible and dangerous scheme, they badly need to think again.